If you were planning to use whatever ground beef you have in the fridge or freezer to whip up some juicy burgers or meaty chili in the near future, you may want to reconsider your meal plans. That's because one of the country's largest meat processing companies is recalling more than 6.5 million pounds of beef due to a salmonella outbreak that's sickened at least 57 people in 16 states over the past couple of months. The massive red meat recall was issued Thursday by Arizona-based JBS Tolleson, Inc., which is pulling 6,500,966 pounds of "various, non-intact beef products" after the US Department of Agriculture's Food Safety and Inspection Service (FSIS) traced it to a widespread nationwide salmonella outbreak. 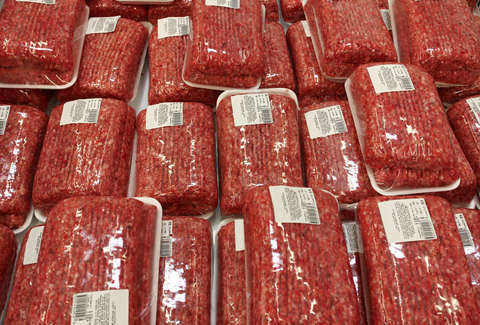 Among the various products are packages of ground beef, which were packed on dates between July 26 and September 7. The affected batch of beef was sold nationwide under brand names Walmart, Cedar River Farms Natural Beef, Showcase, Showcase/Walmart, and JBS Generic, and bears the establishment number "EST.267" inside the USDA mark of inspection, per the recall details. The USDA urges anyone in possession of the potentially tainted products to not eat them, and either throw them away or return them to the place of purchase. Eating food contaminated with salmonella can lead to all manner of nasty symptoms including cramps, fever, and diarrhea, according to the USDA. And it can be particularly dangerous for older adults, infants, and those with weakened immune systems, who can develop especially severe issues. It's unlikely any of the affected packaged meat is still on store shelves, but it's possible its still sitting in some peoples' fridges and freezers. Fortunately, no one has died from the salmonella outbreak linked to the JBS Tolleson beef, but it's still been a fairly dangerous year for food-borne illnesses overall. From tainted fast-food salads and sandwiches, to contaminated cereal, Goldfish crackers, and even almond milk, 2018 has seen a seemingly large number of high-profile food recalls.